A blog for the Bloomingdale neighborhood in Washington, DC. Seasoned chef Robbie Tutlewski, who previously worked under James Beard Foundation Award-winner Chris Bianco in Phoenix, Arizona for several years, is in the early stages of opening a new restaurant in D.C. called Little Donna’s. Tutlewski, whose most recent kitchen stint was a Tail Up Goat, tells Eater his future Italian-meets-Southwestern eatery is at least a year away. He just kicked off a search for a space, and so far he’s got two priorities: He wants to be in a rowhouse, and there needs to be a wood-fired brick pizza oven. “What’s important to me is I am part of the neighborhood,” he says, adding he’d like the spot to be where “industry people like to eat.” He likes the “feel” of Brookland, so that’s a possibility, as are Adams Morgan and Capitol Hill, where he lives. For now, he’s hosting a series of pop-ups and catering gigs to get the word out. The first will be held at District Space (3522 12th Street NE) on Friday, May 18 and Saturday, May 19, with a debut seven-course “Desert to District” menu (view it here). Tutlewski clocked nearly a decade of experience while working with pizza maestro and cookbook author Bianco, helping run his growing empire of award-winning Italian eateries in Phoenix like Pane Bianco and Pizzeria Bianco. He moved to D.C. last July, and soon snapped up a gig at the Michelin-starred Adams Morgan restaurant. “I thought I was going to wait and take it easy because I came from running six restaurants for nine years in Phoenix. It was a ton of work,” he says. He left Tail Up Goat two months ago and immediately jump-started a business plan to bring Little Donna’s to D.C., fueled by his desire to continue cooking over an open flame. “I’ve grown to know and love wood-fired stoves and grills,” he says. While there will be pizza on the menu, he’s not aiming to be a pizzeria, per se. He wants to offer “reasonably priced food” and make Little Donna’s — named after his mother — “something that feels good to support.” While he waits for his brick-and-mortar restaurant, he’s making the most of his roving lifestyle by testing out dishes from coast to coast. 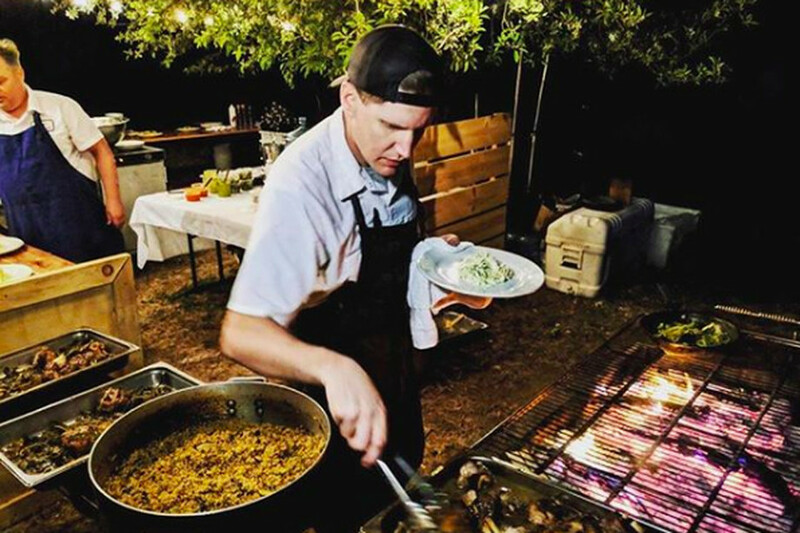 Last month he returned to Arizona to cook a scenic outdoor dinner featuring smoked trout with pickled beets and green goddess dressing at Sedona’s Slide Rock State Park, hosted by Cloth & Flame. And for Mother’s Day, he’s hosting a four-course dinner at Richmond’s rustic Sub Rosa Bakery. The tentative menu calls for hand-pulled mozzarella, asparagus, broccolini. spring onions and lemon gremolata and crispy potato gnocchi with clam and mussel ragout, smoked blue fish, and ramps.